A new set of DIN norms introduced in July 2017 defines the requirements for the waterproofing of buildings, superseding DIN 18195. The new DIN 18534 deals specifically with the waterproofing for indoor applications. Part 1 of DIN 18534 details the requirements and principles for design and execution, addressing also the issue of sealing bathtubs and shower surfaces. Waterproofing is mandatory. This has a bearing on all private and commercial properties, new buildings and bathroom renovations. Sealing tapes applied to the bath rim meet the norm. Silicone joints applied to the bath rim absolutely do NOT meet the norm. Installer, tiler and planner – all trades involved in construction are responsible for secure waterproofing to DIN 18534. This requires agreement and careful coordination of activities between the various trades. We recommend to have KALDEWEI sealing applied to the shower or bathtub by the installer. The revised norm refers to “useful life” without specifying its length. Bathrooms are generally used over long periods of time, often more than 30 years. This means that the waterproofing solution must last just as long. The norm differentiates between four water action classes, rated from low (W0-I) to very high (W3-I). The relevant water action class dictates the waterproofing material to be used for indoor applications. KALDEWEI sealing kits can be combined with all common waterproofing material based on chemical formulations used in the construction industry. Extremely flexible and thin waterproofing material. Easy-to-apply adhesive strips for bath or shower tray. Preformed corner pieces that conform precisely to the geometry of KALDEWEI bathtubs and shower trays. No tedious shaping of the tape to seal corners, no integration of multiple layers into the composite sealing. Wall corner and flexible multifunctional corner piece for different wall and floor applications. The complete sealing system designed for floor-level KALDEWEI shower surfaces consists of: an insulation strip, 2 corner pro les for wall corners and 4 multifunctional corners. This ensures waterproof installation of shower surfaces in almost all standard installation situations. This kit consists of all components needed to seal bathtubs and elevated shower surfaces installed in corners and niches. 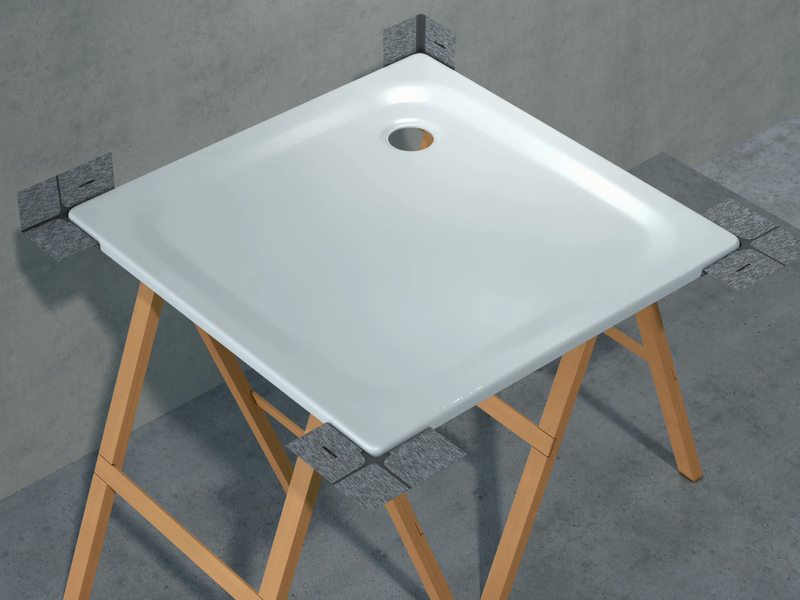 The test structure of installed shower surface and attached KALDEWEI sealing kit with sealing strip and corner pieces is completely impermeable – as confirmed by the renowned test institute Säurefliesner Vereinigung e.V. (SFV) in a test conducted to the standards required for general appraisal certificates. The leitmotif of our shower surfaces is best expressed by the ESR FLOOR-LEVEL. 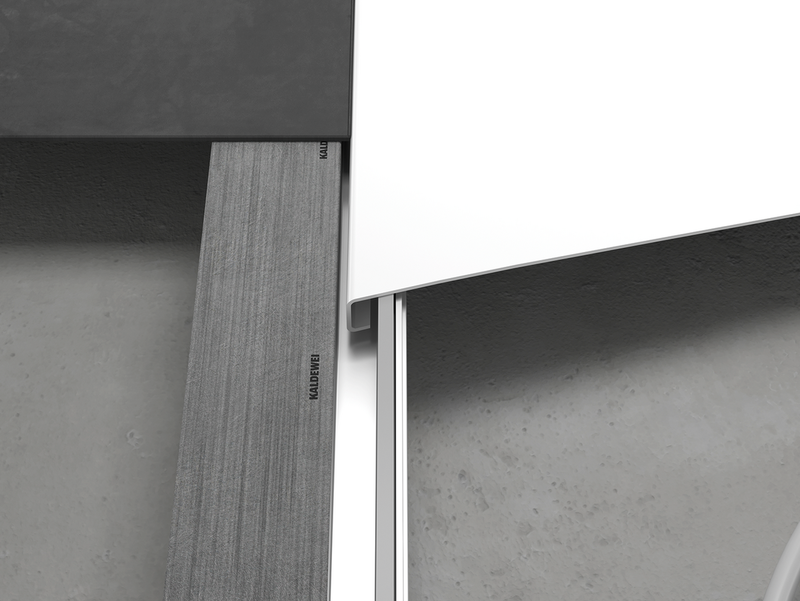 It’s all in the name: designed to be installed fully flush to floor, the ESR coordinates perfectly with the KALDEWEI shower surfaces. The ESR FLOOR-LEVEL improves on its predecessor in many aspects. For easy and secure floor-level installation of rectangular KALDEWEI shower surfaces. Available in almost 50 sizes from 75 x 80 cm to 100 x 180 cm. 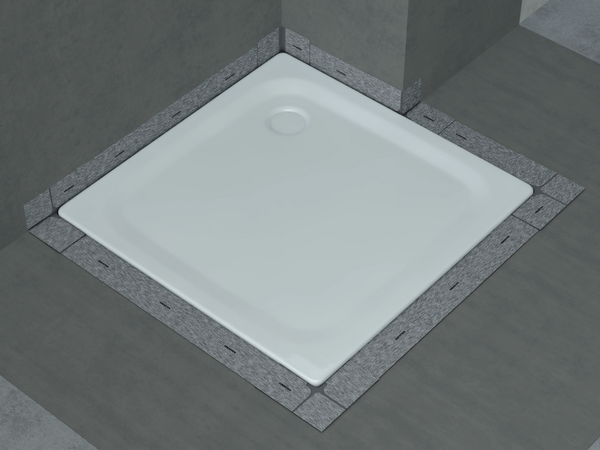 The system solution includes: A fully pre-assembled frame with sound insulation for the corresponding shower surface, a sound-insulated 3D Flex leg system (49 to 164 mm), an Allen key for final height adjustment, floor fasteners, sealing kit FLOOR-LEVEL for the ESR consisting of an insulation strip, 2 corner pro les for wall corners, 4 multifunctional corners, fleece butyl sealing strip for inner sealing, recess aids/formwork panels for the screed recesses, tiling aids. Pre-assembled: Fully pre-assembled, the solid aluminium frame makes a perfect fit for the shower surface, eliminating the need for cut-to-size assembly on site. Complete system: All relevant components are included and perfectly matched. Sound insulation tape and foot units are pre-assembled to the frame. The system is supplied with recess aids and formwork panels for the screed recesses, floor fasteners to secure the support in place, the sealing kit and tiling aids. 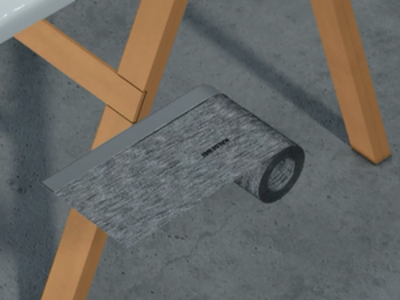 The sound-insulated feet can be adjusted from 49 to 164 mm. No special tools are needed for adjustments. New to the range is the optional extension kit for special heights up to 250 mm. 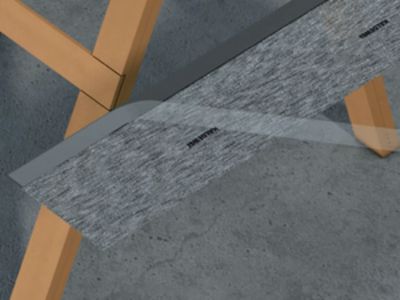 The trusted anti-seepage connection with backflow preventer is integrated in the frame profile between the two waterproofing layers. Connected to the special waste fitting, it channels penetrating shower water directly to the siphon. The 3D leg system can be adjusted both horizontally and vertically, making it easier to work around piping and other obstacles. Not only that but height and levelling on uneven floors can easily be modified at any later point and can now also be fined-tuned from above using the Allen key supplied. The ESR FLOOR-LEVEL allows effective coordination of all trades involved in the project: Once the ESR FLOOR-LEVEL is correctly positioned, the screed and tiling can be completed. Waste fitting and shower surface are installed at the very end, protecting the shower surface as long as possible from adverse effects. 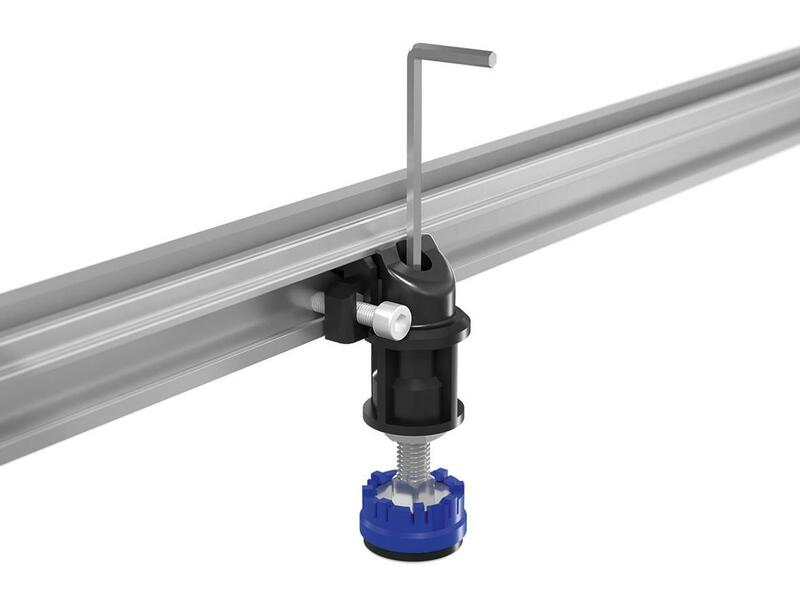 The system solution now includes the new KALDEWEI sealing kit. Specially developed for FLOOR-LEVEL sealing, the insulation strip and preformed corner profiles in the kit are applied directly to the frame, not the shower surface. This prevents moisture from penetrating the building structure, while the installation system ensures easy installation. The ESR FLOOR-LEVEL is completed by a second, continuous waterproofing layer. Applied directly to the frame profile, it is designed to seal the shower surface to the inside. The supplied fleece butyl sealing strip is simply attached along the predefined edge of the frame. Once in place, it remains flexible and ductile. The result is reliable protection of the area under the shower surface against water penetration. 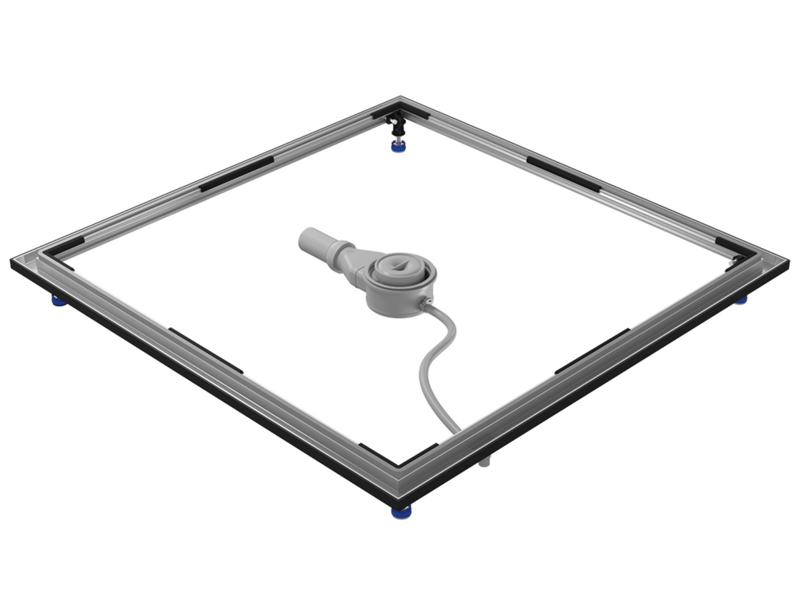 The test structure of installed shower surface and ESR FLOOR-LEVEL is also completely impermeable – as confirmed by the renowned test institute Säurefliesner Vereinigung e.V. (SFV) in a test conducted to the standards required for general appraisal certificates. Where complete composite sealing of the area under the shower is structurally impossible or difficult, the Austrian ÖNORM B3407 and Fact Sheet 3 of the Austrian Tiling Association require the use of custom designs. 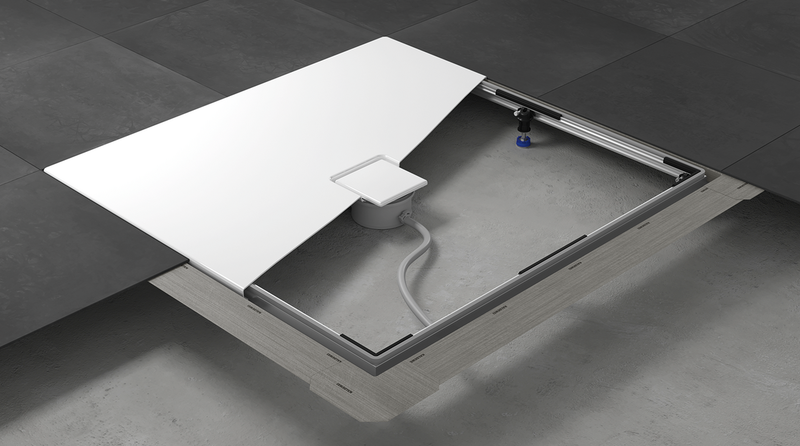 Thanks to the exclusive configuration of the ESR FLOOR-LEVEL – with a sealing kit comprising pre-assembled corner pieces, inner sealing and anti-seepage connection – the system provides complete protection against moisture penetration. Depending on the design of the shower surface, the required water seal height and the drainage direction, KALDEWEI offers waste fittings designed specifically for the ESR FLOOR-LEVEL and its anti-seepage connection. For optimum stability, a MAS central support system is recommended for shower surfaces larger than 90 x 90 cm. KALDEWEI offers the right solution for any design. Enables special installation heights of 164 to 250 mm. Available in 3 sets with 4, 5 or 6 foot units for arrangement to suit the number of foot units of the ESR FLOOR-LEVEL.